From the top down, News Corporation is an organisation without a clear ethical framework, says managing editor David Donovan. Any claims of the moral superiority of News Corporation publications in Australia in comparison to the firm's British publications have been further eroded by revelations made in Victoria’s Magistrate Court yesterday. The setting was a case against Victorian Police officer Simon Justin Artz, who is accused of leaking information to The Australian journalist Cameron Stewart about a sensitive Australian Federal Police operation against a terrorist cell in Melbourne. Controversially, the newspaper published details of the raids on Melbourne homes last year hours before they were carried out, putting the entire operation – and officers' lives – in jeopardy. The ethical vacuum at the heart of News Corporation was revealed when Australian Federal Police Commissioner Tony Negus revealed in court that he all but pleaded with then The Australian editor Paul Whittaker (now editor of Sydney's Daily Telegraph newspaper) to not publish details of the raids. Mr Negus says he told Mr Whittaker that if The Australian published its planned story, the targets of its operation, believed to have links to Somali terrorist group al-Shabab, could ''go to the nearest shopping centre and decide to take action''. The Police Commissioner said he found Whittaker’s question “reprehensible”. Of course, in Britain, News Corp's subsidiary News International, has been found to have been aware of its employees illegally hacking into a vast number of phones, notably including the cell phone of murdered schoolgirl Millie Dowler — even deleting messages while the police search for the girl continued, thereby callously providing Millie's family with false hope that the child still remained alive. This was merely one of a plethora of immoral and illegal activities the company has been found to have engaged in. In Australia, there is an attitude that this sort of thing could not happen in Australia — that the competition in this country is not so fierce as in the UK, therefore the pressure to engage in unethical sorts of practices isn't present. In recent months, decrying the need for a media inquiry, we have seen a procession of paid News Limited hacks, even including its Australian CEO John Hartigan, obviously under instruction, unconvincingly making this basic argument in a range of different ways. The testimony of Tony Negus, however, reveals this to be a convenient untruth. Moreover, the activities of the The Australian's Melbourne stablemate, the Herald Sun, in revealing facts leaked from the Victorian Police that made it blatantly obvious that gaoled gangland boss Carl Williams had become a paid police informant, and which then directly led to his murder by a disgruntled inmate, is another example of a Corporation quite willing to gamble with people’s lives in the pursuit of a story. And there is more information to come about the cosy relationship between News Corporation and certain elements within the constabulary in Victoria, something News Corporation was also damned for in Britain. The vicious and unprincipled way News Corporation went after Victorian Police Commisioner Christine Nixon, and her successor Simon Overland, should also leave any casual observer with strong concerns about the ethical standards of this organisation. Former Herald Sun editor Bruce Guthrie won a famous unfair dismissal case in April last year against the News Corporation subsidiary the Herald and Weekly Times, eventually writing a book about the experience: Man bites Murdoch. Interestingly, in the weeks before the case was heard, his house was broken into and robbed. In his book, Guthrie reveals a corporate culture, spread across the entire global organisation, where the discussion and observation of ethics was even directly frowned upon from up high. Guthrie recalls an incident at a global News Corporation conference in the glitzy North American ski resort of Aspen in 1992, in which he earned the ire of none other than the proprietor himself after questioning the ethical framework of one of Murdoch’s favourite, yet infamous, British redtops, The Sun. Excruciatingly for Guthrie, the noise was such that Petrie missed the question, necessitating Guthrie having to repeat it — three times. Guthrie says that Murdoch turned red when he first asked the question and then blue when he repeated it. Eventually, Petrie replied thoughtfully that The Sun had no ethical framework at all. "I left that conference more than 20 years ago concerned that Murdoch saw ethics, or at least the discussion of them, as an inconvenience that got in the way of newspaper business. If that really is the case, should we be entirely surprised that the phone hacking scandal played out at one of his titles and that it ended in its forced closure?" A commitment to ethics permeates from the top down throughout an organisation — there is clearly no such commitment at the top of News Corporation. Therefore, it follows that practices occurring in one part of this global organisation are more than likely present in other parts — they simply may not yet be apparent to the casual observer. Australia desperately needs a comprehensive media inquiry — with teeth, ready to delve deeply into the Australian media landscape searching for the unpleasant truths we have every reason to suspect it will find. Read about another recent example of unethical behaviour by The Australian newspaper. 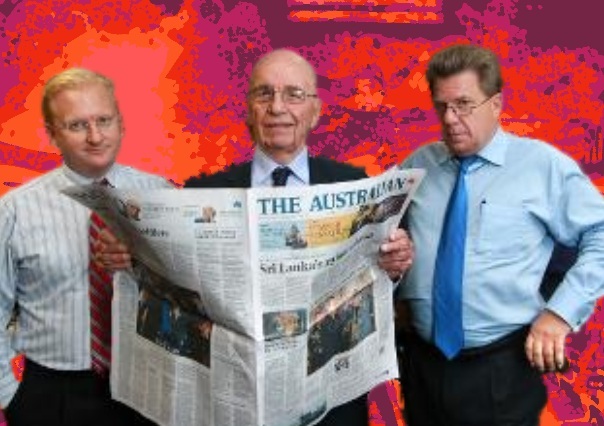 Support a comprehensive inquiry into Australia’s dodgy media on Facebook.